We are excited to have Howard Garrett, aka the Dirt Doctor, participating in Birdzilla.com. Howard is a leading proponent of organic gardening and eliminating the use of harmful pesticides and fertilizers in our yards. His radio show is heard on over 200 stations across the United States. From time to time we will post tips from Howard that can help keep your yard and flowers healthy and happy, while protecting the birds. In the mean time you can visit his web site for an incredible amount of information. If you are just starting out you might find his Organic Guides a great place to start. Howard Garrett has developed on online course leading to certification for those who successfully complete the 15 chapter course. Birdzilla.com readers can receive a 10% discount using the code BIRDZILLA10. Here are the details. Our friend Carla Davis has been gardening pesticide free for years. 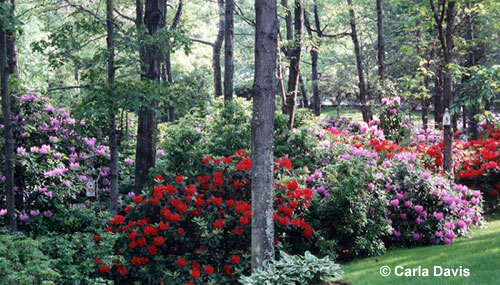 You'll enjoy her comments and the photographs of her beautiful yard. Many people think of backyard birds and gardens in relation to insects, the filet mignon of the bird world, which the birds readily eat and feed to their young. And while this is definitely true, and makes them a gardener's best friend, they do so much more. More than 300 plant species found in eastern forests alone depend on birds to disperse their seeds. Birds love gardens as much as we do, if not more. After all, they are natural-born gardeners, and very efficient to boot. None of us could do a better job at gardening than birds do. The seeds of the fruits they eat pass through their digestive systems whole, get scratched and nicked as they pass through the gizzard in a process called scarification which makes them more likely to propagate. Then the birds add a little high-nitrogen fertilizer as the seeds exit for a little added planting boost. Who could do more? Considering that, it's wonderful that we are now starting to garden for them for a change. In doing so, we are re-creating habitat that has been forever lost to development. At the same time, we are enriching our own lives by inviting nature's most beautiful and interesting creatures into our own backyards. Their brilliant colors, outrageous antics, and incomparable songs add a natural dimension of the highest order to our gardens, and reward our hard work with more satisfaction than flowers alone ever could. Birds and butterflies will feel right at home in this garden. Some of you are already gardeners, and what we have outlined here can be easily assimilated into your backyard habitat. Others may have done nothing more than buy a hanging basket or potted plant that required little more than watering and occasional feeding. Not to worry: Gardening for birds is really simple. They don't require perfection, they like it a little messy, and they are extremely adaptable. After all, they can plant their own food, if you give them the chance. Birds aren't naturally drawn to lawns, since they don't occur in the wild where they live. And lawns are particularly inhospitable to birds, since many of us treat them with numerous chemicals and fertilizers that keep them looking good to us and our neighbors but are deadly to birds. So, if you can find a way to eliminate a portion of your lawn and dedicate it to the birds, you'll save time, energy, and money - and the birds will love you for it. Both novice and experienced gardeners alike should think about just giving up a small (or large) piece of lawn, to be planted by, and for, the birds. Even the smallest parcels of private land almost always have an obligatory lawn and usually more than is really needed. Lawns are not natural, in any sense of the word. They do serve a purpose, in that we play and entertain on them, but some of us maintain them out of a sense of obligation because our neighbors do. 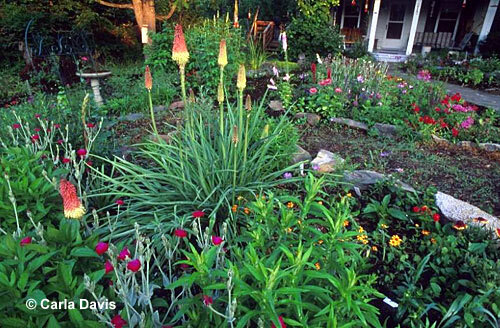 This yard in New York state is bird, butterfly and neighbor friendly - and it is pesticide free! Several things should be taken into consideration when gardening for birds. First, pesticides are poison to the birds, and shouldn't be used. If we invite birds into our gardens with plants that they love, they will find the insects that are present and eat them, eliminating the need to use pesticides. Second, we need to understand that a variety of plantings are needed to fill a variety of needs, like plants for cover and shelter, plants for nesting, and plants for food. Third, we need to replicate the naturally occurring edges that occur in the wild, where the brushy areas meet the fields and woods and attract the greatest number of birds. This can be accomplished be merely planting hedgerows in a zig-zag line, rather than a straight one, thereby increasing the total amount of "edge" in our backyard habitats. And last, we need to plan our gardens so that they span the seasons and provide food for all the backyard bird residents - both the breeders, and migrants that inhabit them.